John Iaboni has been covering the Maple Leafs and the NHL for nearly 30 years. For the last 11 years, he has been the managing editor of the team's game day magazine and now you can share his exclusive inside access. First of all, a confession to all Maple Leafs fans. I was born and raised in Toronto. I, too, have lived through the club's failure to win a Stanley Cup since 1967 and I feel your pain. But I also recall a conversation with George Armstrong, the splendid Maple Leafs captain during the four Stanley Cup teams of the 1960s, who told me the path to the Stanley Cup was easier in his day than it is now in the 30-team National Hockey League. The Chief said there was no way the 1967 Leafs had any gas in the tank left after their second-round upset of the Montreal Canadiens. The fact there were only two rounds to win in the era of the six-team NHL meant the battered, bruised and aging Leafs found the will to prevail in '67 -- with nothing left had a third or fourth round been required. The Chief knows that attaining hockey's grail is no easy task. Now let's look at the present. Since 1993, the Leafs have worked long and hard to rebuild the prestige lost during the miserable 1980s. In the five years with Pat Quinn associated with the franchise, the regular-season totals always reached 90-or-more points and, until this year, the Leafs always got past the first round of the playoffs. In the last three seasons, the Leafs reached a conference championship, a conference semi-final and a conference quarter-final. The Detroit Red Wings, meanwhile, won the Stanley Cup in 2002 but lost in the quarter-finals in 2001 and 2003 (swept in four, no less); the Dallas Stars reached the conference semi-finals in 2001, missed the playoffs last season and are still alive in 2003; the Colorado Avalanche won the Stanley Cup in 2001, lost the conference championship last year (a 7-0 Game 7 blowout to the Wings) and got bounced out of this year's quarter-finals (blowing a 3-1 series lead against the Minnesota Wild); the New Jersey Devils lost the Stanley Cup final in 2001, were kayoed in the quarter-finals in 2002 and advanced past the quarter-finals this season; and, oh, by the way, the spend-happy New York Rangers missed the playoffs again this year, making it six years in a row without a post-season trip. The ultimate goal for the Leafs is to win the Stanley Cup. I'm not making excuses for them because the Philadelphia Flyers were clearly the better team in their series against the Leafs. But, hey, in the last five years, the Flyers suffered three losses in the quarter-finals (including scoring but two goals in five games against the Ottawa Senators last year), reached the conference championship once and needed seven games to dispose the stubborn Leafs. 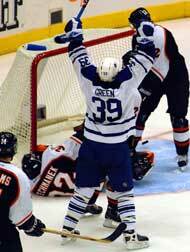 After Travis Green scored in double OT to force Game 7, Leafs fans celebrated long into the overnight hours. I can't tell you how many SUV's I drove past en route to my home who were delirious in showing their Leafs pride. But the joy was short-lived. Seventh heaven at Philadelphia was pure hell for the Leafs and their fans -- just as Game 7 in 1976 proved to be. That year, the gritty Leafs, on five goals from Darryl Sittler in Game 6, pushed the two-time defending champions to brink of elimination only to lose 7-3 in the deciding game at the unfriendly Spectrum. In the aftermath of this year's loss to the Flyers, Toronto is once again rife with rumours that had been silenced since the trade deadline on March 11. How will the new ownership, with Larry Tanenbaum at the helm, operate as it takes over from the Steve Stavro era? Will Pat Quinn be head coach, general manager or, as per status quo, retain both positions? Or will he leave altogether? Travis Green lifted the spirits of Leaf fans before the lopsided seventh game. And, of course, there are stories about dressing room discord where cliques allegedly hampered clicks on the ice. The fact the Leafs failed to meet as a team at a Yorkville watering hole -- therefore emphasizing a lack of harmony - brought back memories of the time a few decades back when some Leafs gathered at another establishment on The Esplanade. They were united on that occasion and took to tossing darts -- at a photo of the despised GM Punch Imlach. Besides, who says players on teams have to love each other in order to win? Does anyone remember the Oakland A's of the 1970s who fought, feuded and showed so much disdain for each other and their owner, Charley O. Finley, that they won three consecutive World Series titles? The New York Post then is the first off the mark to rekindle the Eric Lindros rumour again, proving that this story won't go away. Perhaps one day, it might even turn out to be true. Anyway, it seems the Rangers have decided Eric isn't so great after all, believing his 53-point season is going to be the norm for this guy so they'll help (isn't that neighborly of Slats Sather and the Broadway Blueshirts?) the Leafs fill the No. 2 hole at centre. All the Leafs have to do is pick up the $9.3-million on Lindros's contract and naturally surrender either Nik Antropov or Tomas Kaberle. Yeah, right! To me, the greatest problem the Leafs face is the dearth of young talent within their system. So, after taking a risk by moving Brad Boyes to San Jose for the Owen Nolan trade, let's see them move their best two homegrown young players, Antropov and/or Kaberle, too. How stupid is that, especially considering the failures Lindros endured as a member of the Flyers and the Rangers? Near the tail end of this season and unless he changed his name, the fans at Madison Square Garden weren't chanting "Lou" whenever Lindros touched the puck, they were "booing" the guy who was supposed to lead them out of the wilderness. Lindros broke into the NHL in 1992 and has played in the Stanley Cup playoffs five times in his career. In his last playoff game -- in 2000 -- Scott Stevens delivered a check that almost ended Lindros's career, or have we forgotten No. 88 is still perhaps one more concussion away from ending his career? What arose among the media and the fans in the aftermath of Toronto's defeat this season is only the beginning of a long summer that will be filled with speculation, innuendo and truths. But, like Don Cherry, I believe the Leafs do have the nucleus of a strong team. Changes will be made because they have to be made in order to address the deficiencies. But what the Leafs must do is to avoid panic and use perspective. This is not a club that has to be demolished. Sometimes, a step back is required before making the ultimate climb. The cup -- as in Stanley -- looks empty now than half full from the Leafs viewpoint. But the Leafs really aren't that far away if they develop and employ some promising youth, make the right acquisitions and follow the course that has seen them make the playoffs five years in a row for the first time in more than two decades.